Elise is living proof that training and the right nutrition, will set you up to perform optimally in every aspect of your life – from the gym to the office. A full-time digital marketer, Elise was super active at school & university competing in Surf Life Saving & surfing. A huge training load & highly functioning metabolism meant she was able, at that time, to some what ignore her nutrition and “eat anything”. 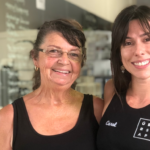 Once she had a full-time job after University, her training load dropped substantially as she focused on other things, however, her bad food habits remained, metabolism slowed & her body fat began to creep up. 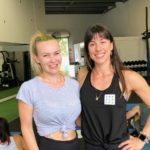 After a period of training by herself with little success or support, she became a member of the Uber Shape Fit Fam around 10 months ago, joining her partner Sarah who was already training with us. She’s also just recently completed her first triathlon, the Kingy Tri in March. She has obviously caught the tri bug, having just bought a new bike & signing up for her next one in May already! Coaches Coby & Jen attribute Elise’s success to her dedication to meal prep each Sunday. She is the first to admit that she didn’t have a great understanding of what to eat & when to best fuel her training & day. Whilst she finds it time-consuming on a Sunday, as someone who works full-time Elise says, “it’s a game changer,” preparing the week’s meals in advance means she can just grab food in the morning & be out the door. 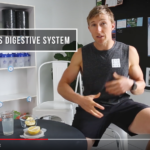 “It’s the thing that’s made this nutrition journey so easy”. Elise loves the conditioning workouts at Uber Shape. She loves the high intensity work which is balanced by dedicated strength days, to ensure clients are training all energy systems & creating the stimulus for fat loss & building muscle. To Elise, the coaching team is part of what sets Uber Shape apart. Elise has also made the switch from coffee to green tea. She used to drink a lot of coffee. This switch has had a positive impact on her adrenal health allowing her central nervous to “rest & digest” rather than being stimulated all of the time. Coffee can promote the storage of fat, particularly around the belly area, which is impact greatly by elevated cortisol. Elise has found the switch has also positively impacted her energy in the afternoons. 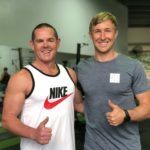 Elise is now working toward a further reduction in body fat to optimize her body composition for performance going into the Byron Bay Triathlon. We can’t wait to see how she goes!